Ranveer Singh is certainly on a roll. 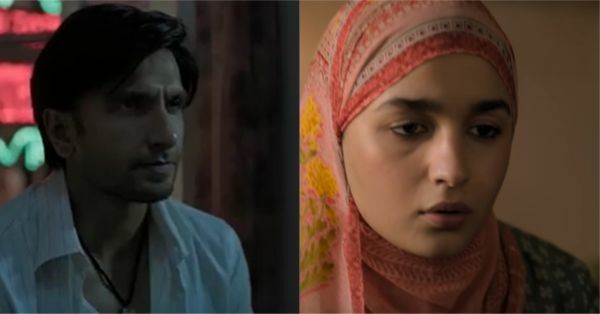 While he is still riding the high from his latest release Simmba, the teaser of his upcoming movie Gully Boy just dropped today. The one-and-a-half-minute teaser lets us peep into the life of Ranveer's character of a rapper-in-the-making. The song Asli Hip Hop plays in the background as we are shown glimpses into what the movie has to offer - rap battles, fight scenes, romance and maybe even a love triangle between the characters of Ranveer Singh, Alia Bhatt and Kalki Koechlin. Ranveer will portray the 'gully boy', and definitely looks the part as he runs around the chawls of Mumbai sporting hoodies. We're still unsure about Alia and Kalki's characters, but it's evident that they portray two very different women. While Alia is mostly dressed in conservative clothes and a hijab, Kalki's character is seen spray painting the streets in a tank top and jeans. Not long after Ranveer posted the teaser on Instagram, his wife Deepika Padukone was quick to shower him with praises, commenting, "You are unstoppable!" followed by, "I love you and I'm so proud of you!" Bollywood has also given Ranveer Singh and Zoya Akhtar a thumbs up for the teaser. Here's what the celebrities are saying. The movie is based on the life of real-life rapper Vivian Fernandes, known as Divine, who rose to fame after his song Mere Gully Mein was released in 2015. The teaser definitely leaves us on the edge of our seat, and we can't wait for the movie to release on February 14!